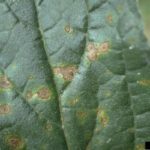 Alternaria leaf spot in the garden is a real problem for growers of brassicas, but it also makes life miserable for tomato and potato growers, causing plaque-like spots on leaves and fruits. Treating alternaria can be difficult, so many gardeners do what they can to prevent this fungus from getting a toe-hold in their plots. 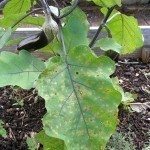 Let’s learn more on what is alternaria and how to treat this gardener’s nightmare. The fungal pathogens in the genus Alternaria can be devastating to plants year after year. The spores overwinter on old plant debris and attach themselves to seeds, making alternaria leaf spot especially tricky to completely eliminate if you save your own seeds. 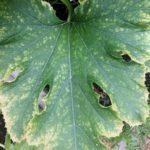 Garden vegetables are common targets of these wind-blown spores, but alternaria is not discriminatory in the plants it attacks — apples, citrus, ornamentals and weeds have been known to develop leaf spots caused by this fungus. Alternaria symptoms once infection begins include small, dark, circular spots that regularly reach ½ inch in diameter. As they spread, alternaria leaf spots may change in color from black to tan or gray, with a yellow halo around the outside. Because spot development is heavily influenced by the environment, there are frequently noticeable concentric rings that spread from the initial point of infection. Sporulation causes these spots to develop a fuzzy texture. Some plants tolerate alternaria spots better than others, but as these spots increase on tissues, leaves may wilt or drop, leading to sunburned crops or weak plants. 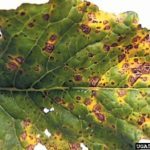 Fruits and vegetable surfaces can be infected with alternaria spots as well, the lesions making them unsightly and unmarketable. Because alternaria can invade tissues invisibly, eating spot-covered produce is not recommended. Treatment for alternaria requires fungicide to be sprayed directly on infected plants, as well as improvements in sanitation and crop rotation to prevent future outbreaks. Organic gardeners are limited to sprays of captan or copper fungicides, making control much more challenging. 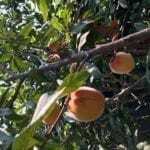 Conventional gardeners can use chlorothanil, fludioxinil, imazalil, iprodine, maneb, mancozeb or thiram on plants listed on the label of their chemical of choice, but should still strive for prevention in areas with known alternaria pathogens. Mulch can help to slow the spread of alternaria spores already in the soil when applied immediately after planting. Experiments at the New York State Agricultural Experiment Station showed that mulched kale crops experienced fewer and less severe problems with alternaria leaf spot than the control plants, with straw mulches significantly more successful at suppression than black plastic or biodegradable plastic mulches. The straw-mulched plants also grew much taller than other plants in the experiment. Crop rotation is vital to preventing alternaria fungal spores from germinating – although the many alternaria fungal diseases look similar, the fungi themselves are often very specialized in the type of plant they will attack; gardens on four year rotations can avoid alternaria building in the soil. Cleaning up fallen leaves and spent plants as soon as possible will also limit the number of spores in the soil. Healthy, well-spaced plants tend to suffer less severe damage from alternaria than their overly-stressed kin.